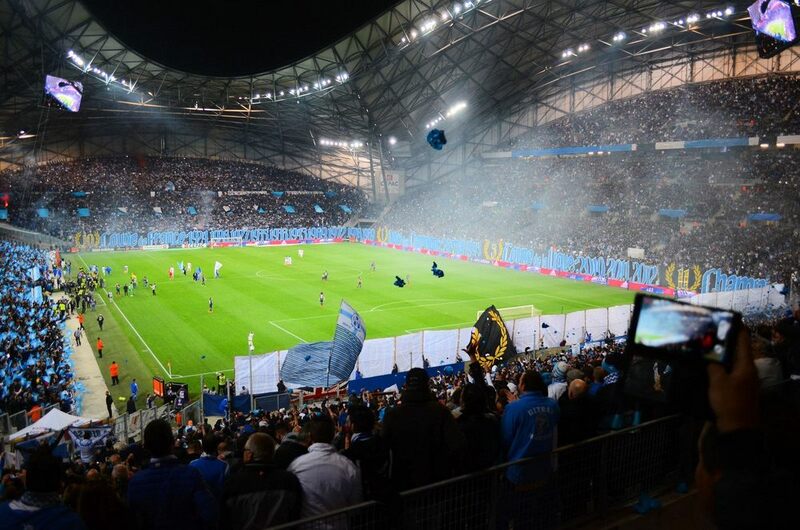 This time next year the stadium will be turning 80, but it’s as young as ever thanks to a lavish redevelopment that made it Marseille’s largest building. It’s been an oval for its entire history and as far as the blueprint goes, it’s still oval. But when you consider the seating bowl, that’s a proper football stadium, one with immense roof rising high into the skyline. Meet France’s second largest stadium, Stade Vélodrome. As the name suggests, it actually had a velodrome inside after opening in 1937 and the structure remained for decades before Olympique’s popularity forced the cyclists out. First, temporary stands were mounted atop the track and finally before the 1998 World Cup all of the stands were rebuilt. Only a small part of the western grandstand was left of the old structure. After reconfiguration it accommodated 60,000 people on stands that had no match worldwide in terms of shape. Since late 1990s it became a question of how the stadium should be covered and improved further. But, despite several concepts being drawn, none of them was as bold as the one implemented. As required in an international design+build+operate tender of 2010, the stadium was expected to grow by 5,000-7,000 and receive full cover, as well as complete upgrade of its infrastructure. 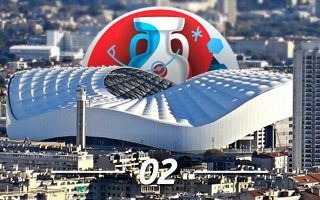 The scheme was fit for both Olympique’s needs and Euro 2016 requirements. Both ends were left without changes, while the east stand received an upper tier (reaching a stunning size of 22,000!). Only the west side was demolished entirely and rebuilt to reach its current height of 65 metres. All of it was covered with a new canopy and , despite having only one new stand built, the new stadium seems nothing like the old one. Price of the project proved very steep at nearly €270 million ($365m), with funding spread over 30 years. The stadium lies just 3km south of the city centre along a straight line. That line is called Rue de Rome, Avenue de Prado or Boulevard Michelet, depending on which part of this wide and picturesque avenue you’re in. Either way, it’s a 30-minute walk or a much shorter bus trip. The stadium also lies at the end of the city’s southern subway line, making it convenient to get to. The winning design by SCAU is so monumental that… it received some criticism! Marseille is predominantly low-rise so a stadium of such immense size (65m tall!) dominates the south’s skyline, standing out from the urban fabric. This was even seen in its jury rating during our Stadium of the Year vote, though obviously the jury were also impressed by its dynamic and imposing outer shape. Though covered by “standard” ETFE membrane, the roof is one-of-a-kind piece of architecture and engineering! Also on the inside the dome makes a humbling impression with its size. New seating layout didn’t minimize flaws of the old one. This includes compromised sightlines on both ends (growing distance to the field) and part of the east stand. Then again, new additions surely improve what was previously on offer and the viewing conditions are surely decent. Particularly impressive are the east and west sides. East stand holds a stunning number of 22,000 people, while the west side is smaller only due to accommodation of almost all corporate clients. With roughly 60 skyboxes and 6,000 business seats, it’s still a towering wall of 19,000 people. Added hospitality space of 7,000 square meters also makes it a good facility to commercialise not only on matchdays. The city is to pay €12 million annually for 30 years to pay off the contractor/operator’s bill and Olympique surely need to draw as many people inside as possible to get the revenue they would hope for. And while in 2015 that number was over 50,000 on average, in 2016 every game had a turnout 10,000 lower.